The Bertini seed train manages to make a seed bed, using a turbo knife that digs into and cuts away old crop residue. Two elastic skate boards alongside the turbo knife consolidate the furrow side walls. 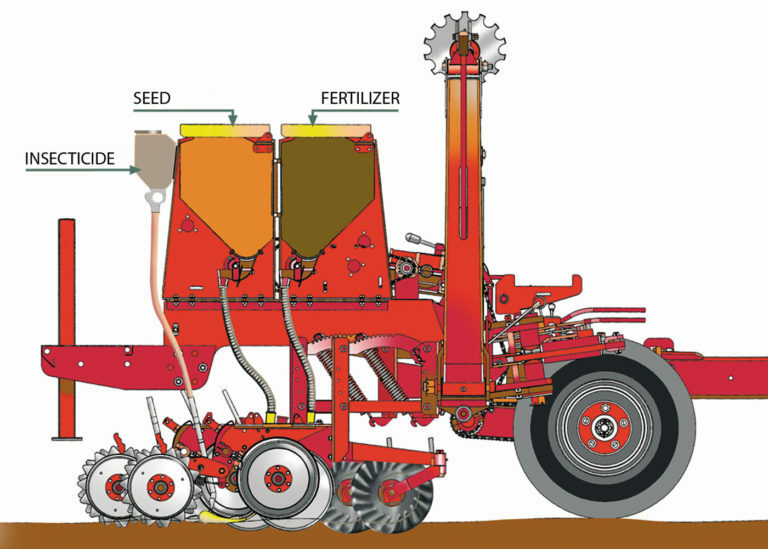 In the seed bed thus created, a narrow double disc with a set of attached double metal wheels places the seed at the correct depth. The metal wheels which have a mechanism for depth control, operate with precision. The metal wheels also have a scraper that keeps the double discs clean. This permits the drill to work even in the wettest and muddiest conditions. A plastic seed firmer consolidates the seed to soil contact. A pair of rear wheels, spring-loaded and positioned to form a V-shape with a variable angle of attack, consolidate the sidewalls thereby leaving the centre free for the plant shoot to emerge. On this seed train, there are more than 8 patents that support all of the existing developments. The ball bearings of the moving parts are composed of 16 tiny balls, 8mm in diameter that make them long lasting and durable. - The straw skateboards are made of tempered steel, as are all of their component fittings. - The depth control wheels are made from a single steel piece SAE1070. The same steel is used in the double discs. The Bertini depth control wheels have three characteristics that make them unique. 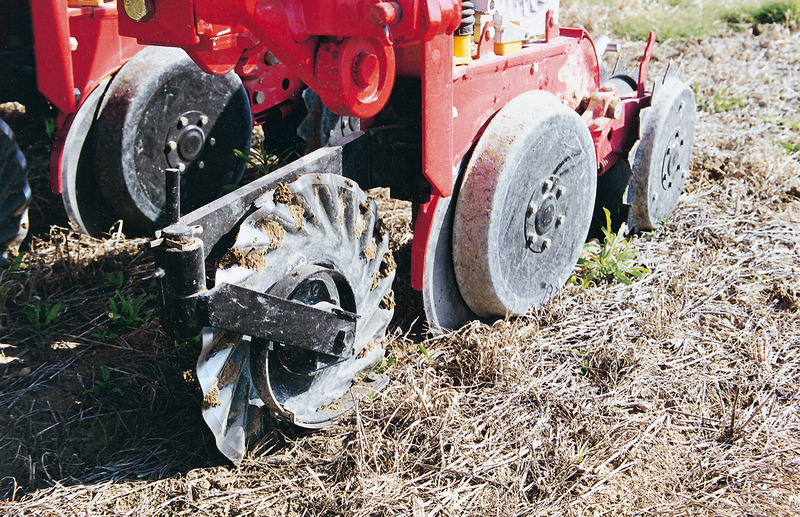 a) The narrow wheels create an even narrower indentation in the soil which increases the pressure on the stubble area whilst maintaining an even depth of seeding.b) The wheels are metallic and therefore make it difficult for soil to adhere to the rim. If this did occur a metal scraper is attached that would keep it clean. Because of this the wheel always keeps its narrow outline, and can drill in very muddy conditions. c) The wheels are slightly conical in shape and have perimetral edges that support the double discs. The pressure each wheel receives is released horizontally therefore slightly pressing against the disc. This stops any ingress of soil or straw on the interior of the wheels. The rear wheels are tempered and are made out of steel SAE1070. 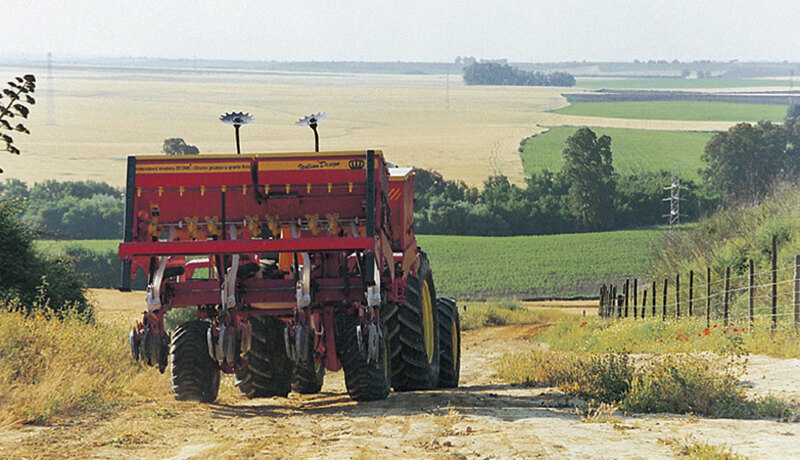 fine seeds, pastures and big grains. 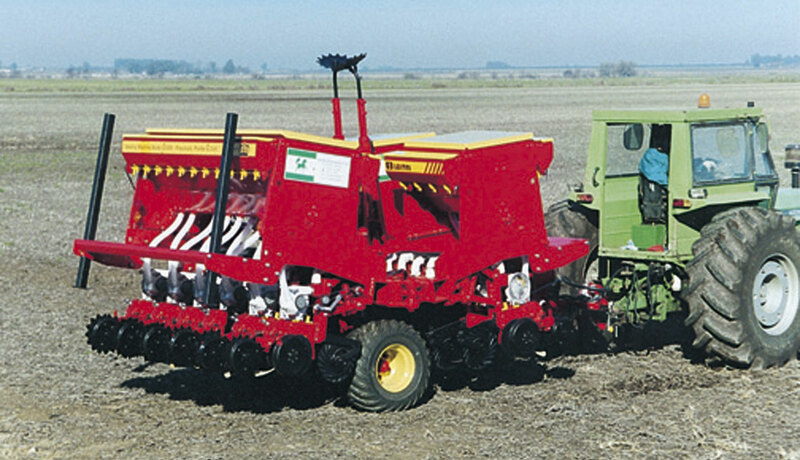 it can drill both fine seeds such as wheat, oats, barley, triticale etc and big seeds such as maize, soya, sunflower and sorghum with precision. 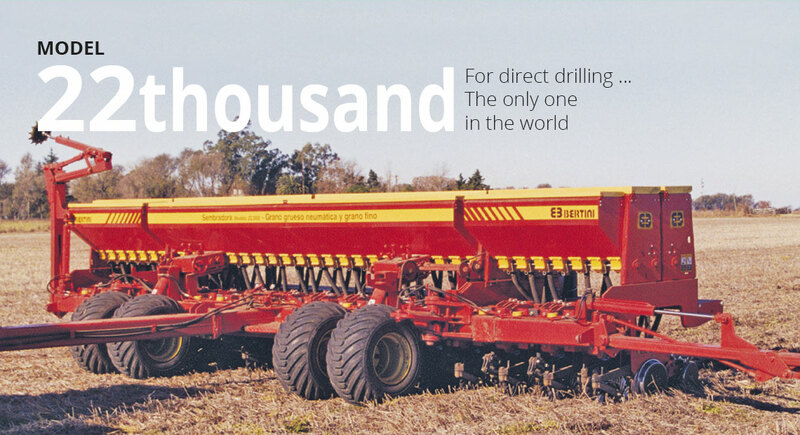 It can be used as a conventional drill, conservationalist drill or for best results as a direct drill. All of the hoppers have plastic rollers (distributors) of a consistent volume which are precise and non-wearing. They are run by gear boxes that maintain a fixed relation with the temperature and do not require adjustments. 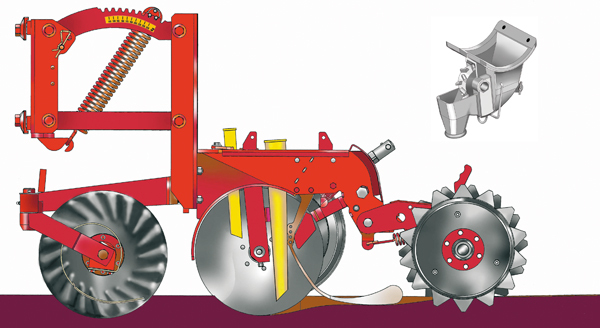 Model B with the rear wheels positioned in a V-shape controls depth , producing a furrow depth of 15cm. 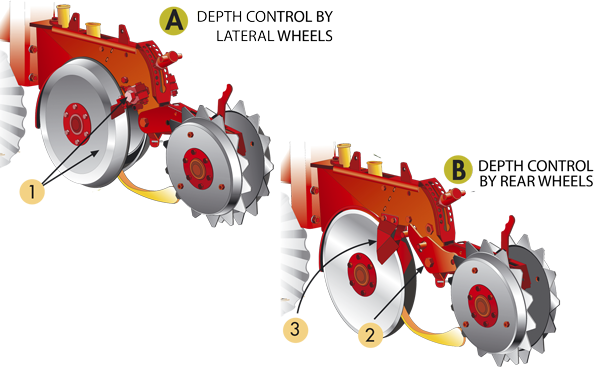 By taking away the depth wheels and their mechanism, we pass from Model A to Model B and vice versa. The monograin pneumatic Bertini system allows us to distribute sunflower, wheat, maize, soya, sorghum etc with total precision. This patented system works by flowing air against the seeds. It is easy to regulate, operate and is long lasting. 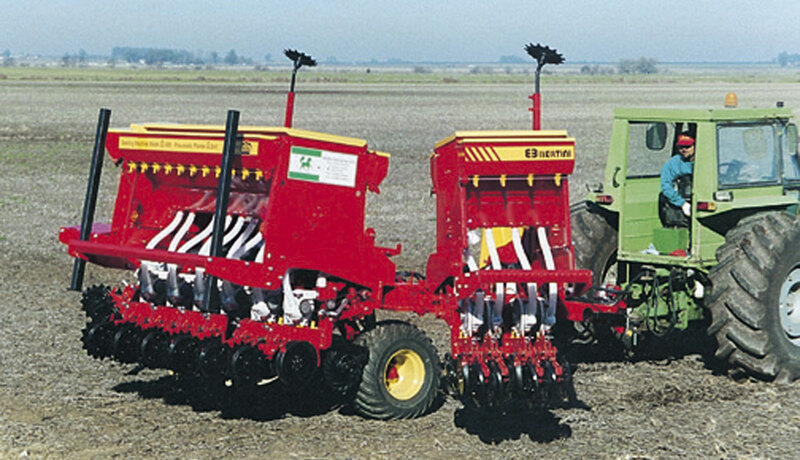 Bertini is the only drill in the world that drills wheat seed in a monograin system and at new intervals of 20cm. 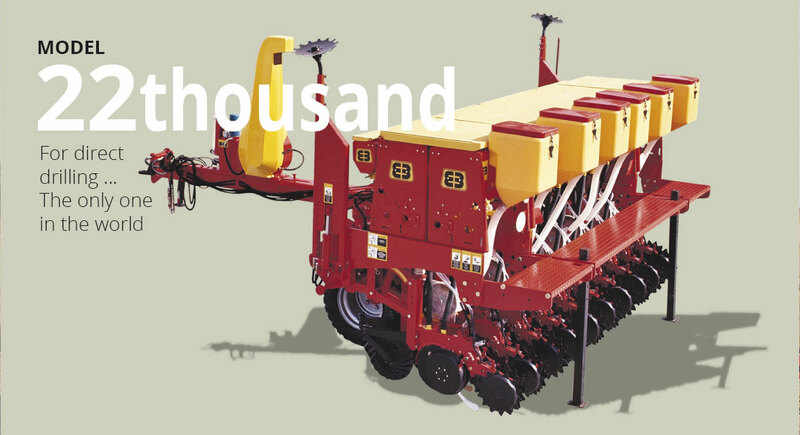 For sowing wheat, barley, triticale, oats etc, Bertini offers a plastic distributor for each row. 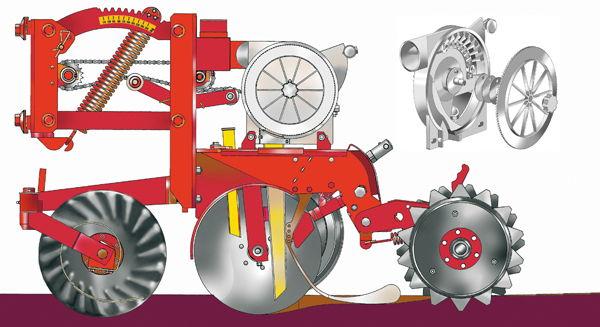 Its 81 speed gearbox (with 3% difference between gears) offers a greater uniformity for sowing. A good sowing practice is for the seed to remain at the required depth, constant and with close soil to seed contact. Bertini are inventors of the seed gearboxes in their three sizes, 81, 27 and 9 Steel bearings SAE 8620 (chrome and nickel) tempered and coated. The BERTINI 22,000 is equipped with 2 gear boxes (81 speed). One for fertiliser and one for seed. A third gearbox (9x2 = 18 gears) provides the facility to drill lucerne and slug pellets. The 22,000 model has a simple folding mechanism. This enables a single operator, using the hydraulic command to either prepare the machine for work or to fold it for transport. In work mode the weight of the machine is on top of the opening turbo knives, enabling them to be more effective, whereas in the transport mode the weight is evenly distributed for ease of movement.